DMIC belt contract workers exploited of their rights. Auto hub worst affected due to management practices. The struggle of 3000 Honda Motorcycles and Scooters India (HMSI) workers of Tapukara plant in Alwar, situated at Haryana-Rajasthan border, in the face of brutal repression from the management-police-administration side, has emerged as an important and intense workers struggle at the present time. As the workers saw commonality and forged unity across internal segmentation, initiated the process of Union formation on 6 August 2015 and submitted a collective Charter of Demand on 14 December 2015, they faced attacks in various forms. It included a criminal conspiracy by the Management to suppress the workers collectivity and Union process using deceitful legal and manifestly illegal means via labour department and the Court, transfer-suspension-termination of Union leaders and retrenchment of around 800 active contract workers. On 16th February, 2000 workers across categories of permanent-casual-trainee-contract came together to stop work and do a sit-in strike inside the factory. The immediate reason was an Executive Engineer physically attacking a contract worker in the Paint Shop, forcing the physically unwell worker to work overtime for the fourth consecutive day. Long standing demands of reinstatement of terminated workers and ceasing management attacks on Union formation were stated. The same evening, instead of any negotiation, the workers leadership was immediately abducted and at the behest of the management, the assembled workers were brutally lathi-charged and repressed by Joint Police forces of Rajasthan and Haryana combined with illegal bouncers, Continuous arresting, hounding, and slapping false cases ranging from attempt to murder, rioting to looting, is going on. At present, over 2000 workers have not returned to work, the management is sending mass suspension letters to hundreds of workers, as they bring in contract workers from far-away states to illegally resume production at the cost of workers livelihood. But production continues to drop to a few vehicles from the daily normal output of 5000 units. This repression from the management-police-administration comes as an expressed move to suppress the workers legitimate right to Union formation and collective bargaining, right to permanent jobs, respect and dignity at/of work, and more importantly, the emerging collective strength and subjectivity of workers in the factory and beyond. Even as company profits are soaring to record heights, this repression is to facilitate the continuing unabated exploitation of an insecure and unorganized workforce forced to work, work, and work more without relief, in the underbelly of new industrial regions (like in Tapukara-Khushkhera-Bhiwadi-Neemrana-Bahror) and industrial corridors under ‘Make in India’ through a coercive surveillance and militarized regime. This is the disciplining of, by and for ‘the nation’ that the authoritarian Modi government means when the recent RSS attacks on students, dalits and religious minorities increase by the day. Against these attacks, workers are daily recognizing similar conditions of exploitation and struggling militantly to forge united resistance on the factory-floor and in the industrial areas. Other than then the HMSI workers, workers in Daikin AC in Neemrana, Ahresty in Bawal, Shriram Pistons in Bhiwadi, incarcerated workers in Orient Craft, Maruti Suzuki, Pricol and so on are similarly fighting today. Workers are thus not merely passive subjects of exploitation and repression, but are actively challenging this regime. The struggle is also at the same time global, as similar ongoing workers struggles in China, Turkey, Cambodia to nearby Bangladesh with material linkages to the global production network here show. WE appeal to all pro-worker forces and individuals to extend our Solidarity to the HMSI workers struggle at this crucial juncture. Honda is the world’s largest manufacturer of two wheelers. It has a 26% share in the domestic two-wheeler market, and four plant in India in Manesar (Haryana), Tapukara (Rajasthan), Narsapur, Bengaluru (Karnataka) and Vithalapur (Gujarat). Established in April 2011, the Tapukara plant in Alwar Rajasthan is the second plant of Honda Motorcycles and Scooters India Ltd (HMSI). This is squarely in the Delhi-Mumbai Industrial Corridor, the flagship industrial investment zone now part of ‘Make in India’. The production capacity in its two plants in Manesar and Tapukara rose 30% to 2.8 million units per year in FY 2012-13, clocking surplus profits as real wages dropped or stagnated. The Tapukara factory produces 5000 two-wheelers per day in two assembly lines, 5 models including Activa, Shine, Dio and Aviator. More than 3/4th of the total workforce is contractual: number of permanent workers in HMSI is 466, Trainee and Company Casuals number 100, and there are around 3000 workers on contract. All the workers are to have ITI degree. Most workers in the age group of 23-28 years, and are internal migrants from different districts of Rajasthan and Haryana, also from MP, MH, UP. There is no accommodation provided by the company, so the workers have to stay in private accommodation in Tapukara, Khushkhera, Bhiwadi, Dharuhera, on both sides of Rajasthan-Haryana border. The management claims that from contract and company casual to becoming permanent is a seamless process. However even to hope to legitimately become permanent, could take 8 years, if at all, making more than 3/4th of the workers ‘to-be-permanent-yet-never-to-be’. These contract workers labour in work of perennial nature on its two assembly lines, making them sham contracts. They do similar or more work in the production process as the permanent workers and ‘can’ sit for a test after 3 years of contract. Very few of them pass the test and fewer pass the interview after that. Those who pass both, have to work as ‘Company Casual’ for 2 years. If their work is satisfactory, then they may be taken as ‘Trainee’ for another 3 years and thereafter they may be made permanent. Till date, less than 100 workers have been made ‘Company Casuals’ in this process, and NO ONE has been made permanent through this long process. Workers hired as permanent also had to be in the ‘training period’ with meager monthly stipend for 3 years and then under ‘probation period’ for another 6 months. In reality, the workers have no formal training and are directly sent to the shop floor, where they acquire the required skill in 10-15 days or in a month, depending on the nature of work. All these internal divisions are to make the labour cheap, docile and insecure. These internally segregated workers are also regularly used against each other, given the huge reserve army of labour and throwing crumbs to a miniscule minority absorbed as supervisors. The current use of hundreds of insecure contract workers from Odisha, to replace the HMSI workers ousted through force and deceit after 16 February, point to this management strategy very starkly once again. Explaining this, the management says, “If the market goes down, we cannot throw out people if they are all permanent”. This is a frank admission that job security has no correlation with the back-breaking labour that workers perform but depends entirely on the ups and downs of the financial market, and increasing contractualisation and hire-and-fire policy is the norm. Workers however recognize the similarity of their conditions of exploitation and are uniting across these divisions. This unity in struggle from Maruti Suzuki to Honda then become ‘unrecognized Unions/ unity’ and ‘illegal strikes/associations’. (b). Shifts and Breaks: The Tapukara HMSI plant operates four Shifts: A Shift runs from 6am to 2.30pm, Shift B1 2.30-11pm, Shift B2: 3.20pm-12pm, and Shift C: 11pm-6am (where only the Machine Shop is open), with main production in Shifts A, B1 and B2. The lunch break of 30 minutes and two tea-breaks of 10 minutes each are not included in the work time. (c). Accelerated Time and Work Pressure: To produce 5000 two-wheelers per day, the factory operates through a schizophrenic combination of accelerated time through ‘lean production’ techniques, robotic technology and brute monotonous physical labour. Though segmented through wage division, levels of insecurity of employment, both regular and contract workers work on the same assembly line, under immense work load and pressure. As an example of the work pressure as a component of time, the Engine Line with (no. of workers in two lines in two shifts) 337 workers has a takt time of 18 seconds. That is, every 18 seconds, with each second counting as profit on the balance sheets, an engine is assembled. The Frame Line with around 600 workers has a takt time of 20 seconds, while the Vehicle Quality with 200 workers has a takt time of 17 seconds. In the Die Casting Shop, two workers are supposed be there per machine in a Shift, but in reality there is only one worker per machine, who has to do high-fatigue work for continuous 8 hours. The job includes the manual handling of hot metal of 10 kilogram with a tong and breaking of surplus material (“runner”) physically. There is no provision of ‘reliever’. If someone has to drink water or go to the toilet, other workers have to adjust the work. After 8 hours, the contract workers are regularly forced for overtime. (d). Wage division and Arbitrary Cuts: The wage division of workers segmented into permanent, company casuals, trainee and contract workers is thus: basic pay for permanent workers is Rs. 6,500 and for contract workers it is Rs. 4,700. The overtime rate for permanent workers is Rs. 65 per hour, and for contract workers, Rs. 45 per hour. The total component including incentives comes to Rs. 10-12,000 per month for contract, company casuals and trainee workers, and around Rs. 20,000 per month for a permanent worker. However even working full-time at the break-neck speed, hardly anyone gets this consolidated component, and arbitrary cuts from the incentives are the norm rather than exception. If a worker takes leave in 2 consecutive days, Rs. 4000 is deducted from the monthly salary, which mostly leave only the basic pay as take-home salary. (e). Dignity, Safety and Other Concerns: Workers point out that indignity at work is the norm and the event of 16 February where a contract worker was held by his collar, slapped and beaten up when he refused to do forced overtime for the fourth consecutive day because of his illness, was not an exception. Casteist slurs are regularly passed. When accidents take place, company management tries to put the matter under the carpet and the worker is often given clearance. According to the workers, few months back a worker in the Casting Shop received serious injury in his leg, but he was forced to be inside the plant and have some make-do treatment there itself, which was not adequate. After that he was given clearance and was paid no compensation. Even after repeated requests, no transport facility is provided by the company, so workers have to take private auto services, which carry up to 25 workers in autos with a typical seating capacity of 10. After this kind of risky ride, if a worker is late, he is badly humiliated and often he faces salary cut. (a). Legal Duplicity and Coercion: The application for Union Formation was given on 6 August 2015 to the Registrar of Trade Union, Labour Department, Jaipur, initially signed by 227 permanent workers. All the other workers including company casuals, trainees and contract workers pledged full support and the collective strength grew as conditions and demands are similar. The company responded in a petty underhand manner, by submitting a fake affidavit by impersonating signatures of 21 workers. These 21 workers later filed an affidavit in the Labour department and the Civil Court in Alwar, stating that this was blatant impersonation done by the company and that they in no manner oppose the Union formation as claimed by the Company, but rather are in complete support. The management then responded by filing another challenge to the Union Formation process by submitting another affidavit by three workers–Sumit Tyagi, Arun Kumar and Lokesh Sharma–the first two permanent and the third a contract worker. These are completely pro-management people who have kinship relation with the management personnel. For example, Sumit’s uncle, Rajiv Tyagi, is in the management of Honda Tapukara plant. They have no relation with the larger section of workers, and neither were they among the initial 227 workers who had filed for Union formation. Ironically, this affidavit said that ‘some self-styled leaders have started Union formation process and hence it should be opposed’! Workers had no knowledge of these moves by the management and neither were they informed by the Civil Court Alwar, so this case went on in an one-sided manner, and the Court in November 2015 gave an ex-parte Stay Order in the Union process without listening to the workers side of the story or even having given them a chance to present the same. On 14th December 2015, workers collectively submitted a Charter of Demands to the company. The Labour Department Alwar gave four dates from December 2015 till February 2016, in none of which the management participated. So all tripartite negotiations were snubbed at the beginning, and all legal Trade Union rights of Collective Bargaining and other Constitutional rights have been scuttled. (b). Terminations, Suspensions, Punishments: Along with this, just after the Union formation file was moved by workers, the company responded by retrenching 800 contract workers from September 2015 to early February 2016–particularly those who were outspoken in the Union formation process. This nowhere figures in the official records or balance sheet of the company, also because it need not keep so for regulation by the government. Along with this, contract workers would regularly be made to sign blank papers to pressurize workers and use it as a stick against future moves by workers. The proposed-Union President Naresh Kumar was transferred to a Bihar facility of Honda in November 2015. When Naresh refused to bow down to this coercion, he along with Union Secretary Rajpal and two more workers leaders were terminated from their jobs. Apart from these four terminations, 5 more worker leaders were targeted and suspended. 20 worker leaders including the entire Union body (on whose name the application was filed) were given ‘warning letters’. The supposed domestic enquiry, which the company says it has done to effect these punishments, is a complete eye-wash.
(c). Use of Bouncers: The practices of coercion through various means is wide-spread in the industrial area including the deployment of illegal ‘bouncers’ or goons, typically related to the contractor lobby and the local landed elite. Though the Honda management has claimed that, “We are not that kind of company”, the use of these goons is endemic, particularly since August 2015. The rule in the company is that a contract worker has to be an ITI graduate, given the high-skilled nature of the job. But after the steps taken by workers for Union formation and retrenchment of contract workers as ‘punishment’ by the management, it got hundreds of non-ITI people inside the company as supposed contract workers–whose only work inside the factory was to terrorize workers speaking for their rights. So apart from a ready bouncer and contractor lobby outside the factory, they were given uniforms and were present in all the Shops inside the factory to ‘keep close watch’ and continue the reign of terror. A number of representations pointing to this were sent by workers to various authorities from the local SHO and SDM to the Chief Minister and President, who receipt copies workers posses. It is ironic that a company using ‘lean production’ which among others prides itself in generating consent on the shop-floor through suggestions from the workforce, quality teams and so on, as supposedly distinct from the earlier mass production mechanisms, relies so heavily and systematically on coercive mechanisms and personnel, only so that the collectivity of workers is thwarted. What happened on 16th February 2016? As February came, the amount of work pressure, forced work like forced over-time increased drastically. Workers would have to work for many additional hours after the end of their Shifts. A reason for this increased work pressure was also the termination of a large number of contract workers, which the Union says number around 800. Along with this, company casuals on 11 month contracts, were suddenly removed at 6-7 to 11 months of work, and these contracts were not renewed. On 16th February, just around the time of the end of Shift A at 2.30pm, a Supervisor or Executive Engineer physically attacked and verbal abused a contract worker in the Paint shop for refusal to work overtime. This is attested to by hundreds of workers who bear witness to the same. This contract worker was ill because of having continuously worked over-time for last 3 days before this, but was still being forced to work over-time on that day. When he protested, this Executive Engineer caught hold of his throat, physically attacked and slapped him. This was a regular instance of normal repressive control that the management deploys inside the factory but on 16th February afternoon, the workers decided to unite peacefully and firmly protest against this. All around 2000 workers across categories came together, stopped production, and demanded that action be taken against the said Supervisor. Also the demands of the reinstatement of the 9 terminated and suspended permanent workers, and of the over 400 contract workers recently terminated were reiterated. However, instead of any peaceful negotiation, in a most coordinated and conspiratorial manner, the management called in bouncers and the Police. This was followed by an unprovoked brutal lathicharge by the Rajasthan Police at around 7pm, and a reign of terror was unleashed which continues till this day. Bouncers were called at the entry gate, facilitated by the management personnel and together they closed down the main gate of the factory and restricted the entry of the workers who were supposed to come in the B Shift, and restricted exit of the A Shift workers inside the premises and did not allow them to go out even when they requested for the same. The people from the management directing this were Pradeep Jain, Surender Singh Dagar, Jagram Dalal, Bharat Bhushan, Trilok Chand, Kartar Singh, including Supervisors Moolaram, Resham Singh, Sukhdev and Manoranjan, and those from the Security include Sarvan Kumar, Dharmveer among others. Thereafter police also came on the gates of the factory. Tehsildar also came on the spot and he called 5 people from among the workmen present outside and they went inside for talks with the management. These five workmen included Naresh Kumar, president of the Proposed Union “Honda Motorcycle and Scooter 2f Kamgar Union Tapukara”, Rajpal, Secretary of the Union, Avinash, Mohan Lal, Surendra Singh members of the Union. After being taken inside the factory premises they lost all the contacts with the workers outside. This was at about 04:00 PM in the evening. Then the police came inside the factory premises and they surrounded all the workers sitting inside the factory premises and when it was about 7 Pm in the evening and it was considerably dark, the management people also came and the bouncers and local goons who were also there came inside the factory premises. Then the ADM Harbhan Meena, the Tehsildar and ASP Manoj Kumar came to the workers inside the factory who were sitting inside the factory premises the number of whom would be more than around 1700. Then we were asked to vacate the factory premises upon which it was demanded by the workers that Naresh Kumar the president of the Union be called and thereafter upon his instructions they can leave the factory. Hearing this, the ASP Manoj Kumar said that the Union President can never come at the spot in a taunting tone; he also gave abuses like “Madarchod” “Behen Chod” to the workers. The bouncers called by the company were also abusing the workers in the similar manner. The workers said that they would leave only after the Union President is called. Thereafter the ASP started hitting the machines with the stick he had and told the workmen that once they are beaten up like these machines then only would they leave the premises. He also said that, “aaj main hi yahaan ka SP hoon, DC hoon aur mukhyamatri bhi hoon”. After this he started beating up the workers and the same was followed by other policemen and the bouncers. Around 60-70 workers were severely injured (names withheld, documentary medical evidence provided to the Court). The bouncers in the meanwhile were hitting the machines inside the factory and were also hitting the workers. Then the workers came outside and here also the police started a mass lathi charge, most brutal in nature against all the workers. The workers who were sitting in the first two rows were particularly targeted on their heads and these were the people who got injured the most. The workers ran for their lives in and around the factory premises. There was tear gas shelling and gun firing being done by the police and the bouncers were throwing stones on the workers. The police chased the workers even till their home and arrested them and also till the hospital where some of the workers had gone to get their injuries treated. The police kept chasing the workers for the whole night and kept threatening them, beating them and detaining them and the workers were all running here and there for their lives and safety. On 17th of February, workers so as to assess the damage and injury to the workers and also to help each other were coming to Dharuhera in Haryana. While they were on the way they were identified by the dress they were wearing and the policemen further beat them up while the supervisors were there to point out the workers from Honda factory to them. The Haryana police further detained and lathi-charged on the workers and also detained some of the workers and these people were only released after having taken their money whatever they were carrying, late in the evening. These were around 58 workers in number. These incidents of beatings and threatening also kept happening on 18th and 19th of February. The management version of ‘workers damaging machines’ and ‘use of mild force’ is patently false, as a most brutal repression was set on workers in a coordinated manner. 6 workers had parts of their heads split, 60 others had their writs, legs and backs marked with blood. Hundreds of workers were arrested, and while some were released, 44 workers were charged with criminal cases under IPC Sections 147, 148, 332, 336, 427, and even 307 (Attempt to Murder)! Another 42 other workers in two other separate FIRs have range of cases like rioting, looting, and so on (IPC Sections 147, 149, 323, 342, 395, 427, 452). The 5 workers of the Union leadership who were abducted from the negotiation process itself on 16th Feb, were kept in Police Custody from 16th February till 23rd February, where they were tortured, and then transferred to Kishangarh Jail on 24th Feb. It is clear that a coordinated move on part of the management of Honda Motorcycles &Scooters India Pvt. Ltd. Tapukara Plant, the Police, the District administration and the Labour Office orchestrated the attack on the Honda workers to scuttle their Trade Union Rights, and continue with the particular nature of super-exploitation of workers. Rather than the ghost of ‘politicization from the outside elements’ as the management is invoking, it is the workers own steps at even minimally expressing their own demands or class subjectivity that cannot be tolerated by capitalists or the government. On 19th February, 3000 Honda workers gathered in Gurgaon’s Tau Devilal Stadium, with support from thousands of other workers in the Gurgaon-Manesar-Bawal region and of Trade Unions and workers organisations. Solidarity among workers was strongly felt. Workers and Trade Unions from the Honda plant in Manesar, the four plants of Maruti Suzuki (Gurgaon, Manesar, Powertrain and Suzuki Motorcycles), two plants of Hero Motocorp in Gurgaon, Mico Bosch from Jaipur, Rico Dharuhera, Endurance, Sunbeam, Baxter, Delphi, Lumax, Bajaj Motors, Workers Unions from Bawal including Ahresty, NSK Rane, workers organisations like Workers Solidarity Centre Gurgaon, Inqlabi Mazdoor Kendra, Shramik Sangram Committee and Central Trade Unions AITUC, CITU, AIUTUC, HMS, BMS, INTUC, and so on came in solidarity. A 13 member committee from among these factory-level and central trade unions was formed to support the struggle. Earlier fellow HMSI workers in the Manesar plant had already boycotted food on 16th Feb afternoon in solidarity with the Tapukara plant workers, and against similar management intransigence at their own impending settlement process. 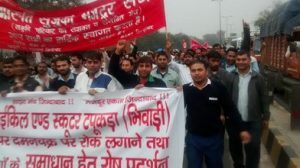 On 19th February, the over 3000 workers marched 8km through the riot-torn streets (due to the concurrent Jat reservation agitation) to the All-India Honda Head Quarters on Faridabad Road in Badshahpur, Gurgaon. However from here too, workers were forced to move out again on 21stFebruary Sunday noon, as the Police used the pretext of the Jat reservation agitators and State-wide curfew to oust the workers. 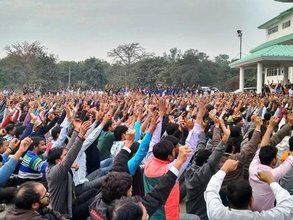 On 23rd February, When Honda workers tried to gather again to peacefully protest in front of the Labour Commissioner’s Office in Jaipur, Rajasthan, permission was denied and early morning a force of 500-700 police personnel came to oust the Daikin AC workers who were already there on dharna. On 26th February, when around thousand HMSI workers came to peacefully demonstrate in Tapukara industrial area, the District magistrate of Alwar cancelled the permission. The heavy police force deployed there aggressively dispersed the workers and took 14 workers to the police station. After the pressurization by various trade union representatives from Honda Manesar, Maruti Gurgaon, Maruti Manesar, Powertrain, Rico Dharuhera etc the police let the workers go at night. These events confirms the generalized state of exception in the entire area, where the workers cannot even peacefully assemble anywhere. The Rajasthan and the Haryana government have consequently refused to allow workers any space in Alwar, Rewari, Gurgaon and Jaipur for their peaceful demonstration. Workers are still being hounded by the police and the administration as part of a larger strategy to suppress workers struggles in the entire industrial belt of Tapukara-Khushkhera-Bhiwadi-Neemrana-Bahror. There are some new FIRs filed, apart from three earlier ones, which accuse the active worker leaders under IPC Section 307, i.e. attempt to murder, and other non-bailable sections. On 25th Feb night, the police again ran a combing operation in Bhiwadi and picked up one worker from his residence. The hounding continues. This is clearly a planned sustained attempt to terrorize the workers of the entire industrial belt so that they don’t dare to get organized and ask for their rights. This is the bottom line of the development model and ‘Make in India’ project. On 1st March, 39 of the 44 Jailed Honda workers finally got bail from Jaipur High Court, after the lower Tijara Court had rejected their bail applications on 26th Feb. However, in a characteristic manner as more and more judgments dealing with labour are coming to signify, as a ‘punishment’, the workers had to produce two jamanati each, and a minimum bond of Rs. 1lakh each! This is almost next to impossible for largely poor migrant workers to produce. 5 workers in the leadership including Union President Naresh Kumar whose names were put in multiple FIRs, got bail similarly three days later. Anticipatory bail applications for 42 workers who have non bailable warrants against them were to be heard as this report was being filed. 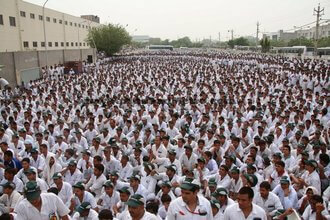 From 2nd-5th March: In the meanwhile, the Company is sending suspension letters on a mass scale to workers. At least a 100 of the 466 permanent workers have already received such letters. IT has brought in a few hundred contract workers from Odisha and other far-away states which is an even more insecure and precarious workforce, to illegally restart production even as the dispute is on and all the workers remain outside. 5 regular workers went to join production two days back due to economic problems and uncertainty, but they too quit in one day, seeing the situation inside the plant. Also as noted earlier, not a single worker from among the contract workers has been made permanent till date through that long process of 8 years since HMSI started operations in Tapukara. But now suddenly, to break the unity of contract and permanent workers, the company two days ago pastes a list of 500 contract workers whose test it had taken in August, that they have supposedly been made permanent! Unfortunately for this piece of management tactics of divide and rule continued, none of those contract workers have made that leap of faith, and chose to remain with the rest of the struggling workers. With the just over 500 new precarious migrant contract workers, unlike what the management is claiming, less than a hundred units are being produced at present in the factory with normal daily output of 5000 units. The workers are determined to fight back in all terrains. In an uncanny similar narrative, on 23 February 2016, a supervisor abused and attacked a worker inside the auto parts company Ahresty in nearby IMT Bawal in the Rajasthan-Haryana border. Post this, the workers and Union representatives had a verbal argument with the Supervisor. Thereafter the General Secretary of the Union was attacked and received serious injury in his head. Later that night, he was kidnapped and badly beaten up by company bouncers. The next morning, on 24 February 2016, the workers of A Shift workers struck work upon arrival, and C shift workers also stayed back. This included workers across segmentations. The Company management was forced to negotiate and retreat. The Police have now arrested the Supervisor and his brother as the accomplice in this case. The strike has been withdrawn after the Police intervention but the tension continues. On the same day on 24 February 2016, lower down in the DMIC, the workers of Tata Nano plant at Sanand, Gujarat, around 400-500 in number, struck work as they demand withdrawal of the illegal and unjust suspension of 20-25 fellow workers. The labour department, which is slow to act when workers raise demands through legitimate channels, was quick to declare it an illegal strike, and used strong arm tactics. This is again as an indication of the struggle for the simple Right of Union formation and renegotiating the burden of work that workers are engaged in. The strike continued for the 10th day on Friday 4th March. Similarly, workers across categories came together in ‘world’s largest AC makers’ Daikin AC in Neemrana industrial area Rajasthan (an AC produced every 25 seconds) to halt production work from 12 noon till 3pm, on 3 February 2016 when a worker whose only ‘crime’ was going to the bathroom to take a piss as the assembly line whirred, was handed the suspension letter and choicest of abuses by the Supervisor. The worker was subsequently reinstated. But this was part of a long drawn two-year long ongoing struggle of the ‘stay-ordered’ (by the High Court acting on the Company representation against the Union formation) Daikin AC Kamgar Union against the regime of exploitation and repression in the factory and area. Since 16th December 2015, around 30 terminated Daikin workers are sitting on indefinite dharna in front of the Labour office in Jaipur, who have been terminated for ‘daring to form Union’ (report by Manmohan, Gen Sec Daikin Kamgar Union in Sangharsrat Mehnatkash no. 27, pg.16). This struggle is on since 2013. Daikin AC workers have also been demanding abolishing of the contract system altogether, unemployment allowance and so on, enthusing other workers facing similar situation to raise their own voices in the industrial area. The same evening, as Dakin workers sat on dharna at the Jaipur labour department, 300 OJT or ‘On-Job-Trainee’ workers at Mico Bosch factory in the RIICO industrial area in Sitapura Jaipur Rajasthan were thrown out of their jobs due to ups and downs in the ‘business environment’, nothing to do with the back-breaking labour they do (as in the termination letter, whose copies we posses). These OJTs, similar to trainees and company casuals in HMSI, with basic wage of Rs.3500-4500 (much less than the minimum wage) are the super-exploited constantly-on-their-toes insecure work force, which is the basis of the ‘Resurgent Rajasthan’ promise of ‘world-class standards’ that BJP Vasundhara Raje government gave to capitalists. IT is a legalization of contractualisation and insecurity within the formal sector as part of the extractive and repressive anti-worker labour regime. The HMSI workers struggle in the immediate industrial belt of Tapukara-Khuskhera assumes significance also because there is NO Workers Union in the area at present. There was a strange case of the Union registered at the Gapai factory, whose change of ownership changed its name to GTIP, and Union disappeared overnight! HMSI Tapukara workers know that the very important struggle of the workers of Shriram Pistons in the adjacent industrial area of Bhiwadi is a significant example. A vendor company of Honda, Maruti Suzuki, Mahindra etc., the 1856 workers faced with extremely exploitative-oppressive working condition and poor wage initiated their Union process on 14 November 2013. Terminations, forced overtime, court cases, threats and beatings through bouncers followed. From 23-28 March 2014, workers occupied the factory, and again from 12-26 April across categories. Workers in the entire belt were emboldened by this struggle. Instead of addressing the legitimate demands through negotiation, a most brutal repression was unleashed on workers on 26 April 2014, at around 4.30am through bouncers and nearly 2000 police personnel, including COBRA and RAF. Criminal cases and hounding continued and the struggle was effectively repressed. But there is an uneasy calm, with unrest rearing to burst out. In all of these struggles, most significantly beginning with Maruti Suzuki 2011, workers grappled with and resisted on their own initiative, the constant pitching of one section of workers against another section. And through this contradictory unity, sought to forge a united resistance to the regime of exploitation and repression. Workers also learnt and executed the form of the factory occupation as the mode of strike. Even where this unity and collective bargaining processes are relatively stronger given recent history of struggles, like in IMT Bawal where the 2nd September strike was also very successful, there is a concerted effort to break it. Take the recent case of Exide Factory in IMT Bawal where Union President Satpal was suspended on 3rd March 2016. This was done as a test case by the management association. Against this attack yesterday, on 3rd March evening, workers from Nerolac, NSK Rane, IJL, Ahresty, Gutterman, Asai Glass India, Mushashi, and so on protested and also marched to the DC to submit a strong protest memorandum. To continue the mad frenzy of exploitation and profit-making, the criminalization of labour through use of brutal repressive measures has become the rule rather than the exception. This is the generalized condition that Modi government is promising as incentive to capitalists to ‘Make in India’. The Haryana Chief Minister announced on 16th February, the formalization of an already present reality: the establishment of more Police stations (and even elite commando camps, as in Manesar after Maruti Suzuki) in all industrial parks. Following on such slew of ‘confidence building measures’ (for whom? ), the ‘reform’ measure of companies employing up to 300 workers being able to close shops without requiring government approval or compensation to workers was also announced. State governments are trying to outdo each other in trying to repress workers and give confidence to capitalists on the latter’s terms. The case of the Maruti Suzuki workers is relatively well-known. In both the cases, workers united across permanent and contract categories to forge united struggle, in both cases, management used bouncers and police to repress workers. 212 Maruti Suzuki workers have fabricated cases of murder, rioting and so on, and 36 workers are still in Jail without bail for the last 4 years (also see similar internal segmentation in Maruti Suzuki). Many other workers in countless other factories in the industrial belt face similar situations of repression of their collective attempts at self-expression. To mention just a few, 15 workers ofOrient Craft in Gurgaon still languish in Jail, in Noida Graziano workers are in Jail since 2009, workers in Sri Ram PistonsBhiwadi and numerous others have criminal cases on them. Recently, 8 workers in Pricol auto factory in Coimbatore Tamil Nadu given ‘double life sentences’ point this similar trend of criminalization of labour under neoliberalism. HMSI Tapukara workers here also remember the experience of the 2005 struggle of Honda HMSI workers in Manesar. The HMSI management says that it did not oppose Union formation in its Manesar plant, so why will it do so in Tapukara. This is a cruel joke, as the Union in the Manesar plant was not a management gift, but forged through a militant struggle of workers which forced the management and government to recognize it. The brutal Police lathicharge on thousands of Honda workers on 25 July 2005 was telecasted across the country, leading to great public outrage. Though gradually again, the problems of increasing internal segmentation, increasing work pressure and insecurity of contract workers, repressive control and so on inevitably came up, the struggle gave strength to processes of workers collective self-assertion and their legal demands of Union formation and so on, in the entire Gurgaon-Manesar industrial belt. And not merely in India, but the material linkages of the global production network, and the integrated global economy of crises, have given rise to struggles everywhere from Turkey to China, from Bangladesh to Cambodia. In the ‘factory of the world’ in China, the significant struggle of the Honda workers starting from Nanhai Honda Lock transmission plant in Foshan near Guangzhou in South-East China on 17 May 2010 spreading to all of Honda’s plants to the record number of strikes in 2015 are linked to the same linked global regime of profit-motive though operating in distinct conditions, set by the global capitalist economy. Thus presently, in the industrial showcase corridor of DMIC, particularly in Haryana and Rajasthan, the issues facing workers are: rampant and increasing contractualisation; increasing work pressure and worsening working conditions; attack on Union formation and collective bargaining; poor or stagnated real wages, and non-implementation or revision of minimum wages; humiliation and indignity at work; work, economic and social insecurity; unfair labour practices including dismissal of workers and worker leaders; use of illegal bouncers; internal segmentation through caste, gender, region; pathetic conditions of living in the industrial areas, and so on. To actively facilitate this, State repression through the Police and administration is openly executed, as in the cases mentioned above as examples. Workers are daily recognizing the exploitative conditions under which they labour, and raising their united voices in their own initiative for their legitimate rights across segmentation against this repressive regime. The struggles are rearing to generalize, and a new class subjectivity rearing to emerge from concrete struggles. Withdraw All False Charges Slapped on Workers, including three FIRs on a total of 86 HMSI workers till now. Stop use of contract labour in work of perennial nature in main production, and withdraw suspension letters to workers in HMSI while labour dispute is going on. End the ongoing police repression and heavy Police presence in the Tapukara and adjacent industrial areas. Release All Jailed Workers and withdraw false criminal cases on all workers. Abolish the Contract work system; and ensure Living Wages for All Workers. Take Back All workers unfairly terminated/suspended for raising Trade Union Rights issues. End Unfair Labour Practices by the managements. Immediately Implement the Just Demands of Honda Motorcycle & Scooter 2f Kamgar Union Tapukara ! End the Regime of Repression-Exploitation in Bhiwadi-Khushkhera-Tapukara-Neemrana-Behror and Gurgaon-Manesar-Bawal Industrial Belt! WORKERS SOLIDARITY CENTER (Gurgaon-Bawal) is an independent workers forum, which seeks to stand with workers in their daily struggles including trade union rights and their own class initiatives in the industrial belt in Haryana and Rajasthan in the DMIC. Its members are mainly workers from various factories in the region who have had a history of struggle, and is run solely from the contributions by workers and pro-worker individuals. This report has been prepared with inputs from interactions during the struggle and legal processes with HMSI and other workers in the industries mentioned in the industrial belt, as well as taking into consideration the management responses so far.